If you are riding a bicycle and a negligent driver of a car or truck hits you, there is little you can do to avoid taking a hard fall and suffer serious bodily injuries. After a bicycle accident, you may need immediate medical treatment and you’ll want to rest assured that your medical bills will be paid by the negligent person who caused your injuries. Avoid talking to any investigators or insurers until you have retained an attorney. Insurers and their investigators are not on your side and are out to serve their own interests: minimizing the liability of negligent persons and their insurance companies. The lawyers at Injury Law Group are dedicated bike accident attorneys who will fight hard for your legal rights. Our award-winning personal injury attorney will meticulously prepare your case to ensure that your medical bills are paid and you receive appropriate financial compensation for your pain and suffering. 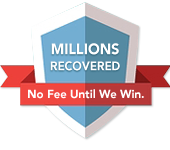 As a Top 10 Personal Injury Attorney, we have the experience and expertise to win your case. We move fast to interview eye witnesses to determine the cause of the accident and better protect your legal rights. We handle all aspects of your case so that you can focus on recovering and rehabilitating from your injuries. With the dedicated team of attorneys at Injury Law Group on your side, you have the best chance of obtaining justice and winning your case. There is little you can do to avoid taking a hard fall and suffer serious bodily injuries. After a bicycle accident, you may need immediate medical treatment and you’ll want to rest assured that your medical bills will be paid by the negligent person who caused your injuries. Avoid talking to any investigators or insurers until you have retained an attorney. Eye witnesses are often the key to helping you successful win your case. A negligent driver of a vehicle who caused your injuries is unlikely to admit to causing your injuries, and most other drivers on the road are paying attention to the other cars, not bicyclists that are far away. Often, an eye witness on the roadside may see a bicycle accident and give a statement to police, which will be incorporated into a police report. A bike accident lawyer at Injury Law Group can promptly determine if such reports were given and obtain a copy of the reports from the police, thereby strengthening your case. When bicyclists and vehicles sharing the roadways respect each other and follow the rules of the road, bicycles, cars, and trucks, can all share the road without incident. But when a careless driver of a car or truck is not paying attention and turns into a bicycle lane or accidentally cut off a biker, the consequences can be catastrophic. When two cars collide, frequently both drivers can walk away from the crash. But when a vehicle collides with a bicycle, the bicyclist will usually suffer much more serious injuries than if he or she had been in the enclosed cabin of a vehicle. If you or a loved one has been injured in a biking accident and are looking for a San Diego bicycle accident lawyer, we can help you. The main cause of bike accidents is a driver failing to see a biker. For this reason, bicycle accidents are more likely to occur at night, which vision is decreased and it is much harder for drivers of vehicles to see bicycle riders. Even with small lights or bicycle reflectors, many drivers of cars and trucks don’t see bicycles. Another common cause of bike accidents is drunk drivers. Driving under the influence of alcohol is a huge problem in our society and leads to many deaths and serious injuries. A driver of a vehicle who is intoxicated is much more likely not to see a bicyclist then if he or she had not been drinking. Other common causes of bicycle accidents include situations where a driver of a car makes an unsafe left-hand or right-hand turn, colliding with a bicycle, clipping a bicycle with the side of a car as a car drives by a bicyclist, or when a careless driver opens the door to his or her vehicle without looking to see if a bicycle is passing by and hits the bicyclist with the car door. California has a bicycle helmet law providing that anyone under the age of 18 riding a bicycle must wear a helmet. Whether you or your family member who is injured in a bicycle accident was wearing a helmet at the time of the accident, may affect your personal injury claim and amount of compensation that your injury lawyer may be able to obtain for you. In the tragic event that a family member is killed in a bicycle accident, as a husband, wife, brother, sister, or parent you have important legal rights. You have a right to recover monetary compensation from the careless person whose negligence caused the loss of your spouse, sibling, or child. With the representation of an experienced bicycle accident attorney, you can recover financial compensation for loss of income or financial support, and for the loss of companionship. Funeral and burial costs are also recoverable from the negligent person who caused the death of your family member. Call us not at Injury Law Group and talk to a bicycle accident lawyer San Diego. We are dedicated California bicycle accident attorneys. We’ll help you obtain medical treatment for your injuries, and we’ll right for your right to financial compensation, while you focus on recovery. 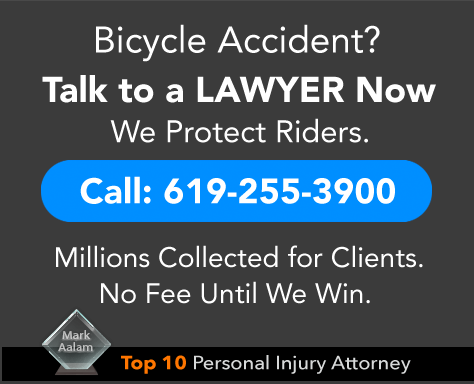 Call now and speak to a dedicated bicycle accident attorney.